A period English Regency fireplace in Statuary marble. The jambs with half rounded reeds surmounted by roundel end blockings. Carved central paterae to frieze. English, circa 1820. One of a very near pair with Stock No 3961. 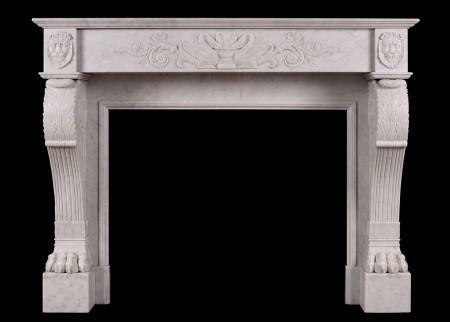 A fine quality antique Italian fireplace carved in Statuary marble. The running frieze delicately carved with sunflowers and foliage with female mask to centre. 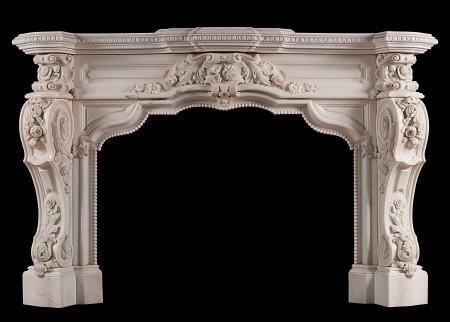 The full round tapering columns with carved turned over acanthus leaves to capitals. Early 19th century. 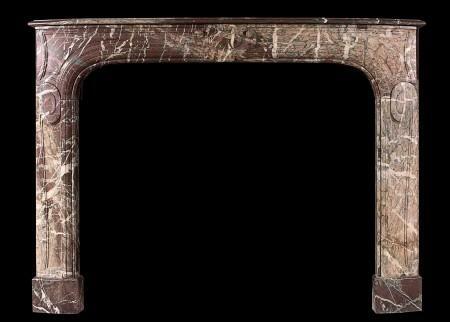 Although this is categorised as Italian, it displays many design qualities attributed to the English Regency period. 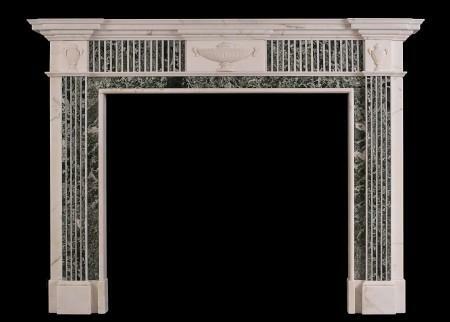 A Regency style fireplace in Swedish green marble with white marble inlay. The jambs with convex flutes, surmounted by carved oval paterae. 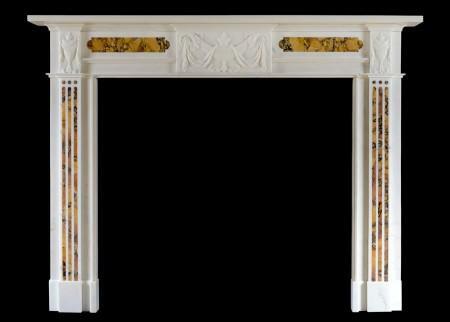 The frieze with full flutes, contrasting the two marbles. Reeded shelf above. English, early 20th century. A Georgian style Statuary marble fireplace with inlaid green Tinos marble fluting. 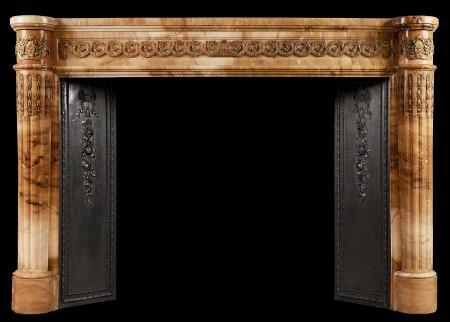 The centre tablet and side blockings with carved Adam style urns with Vitruvian scroll detailing. English, late 19th century. 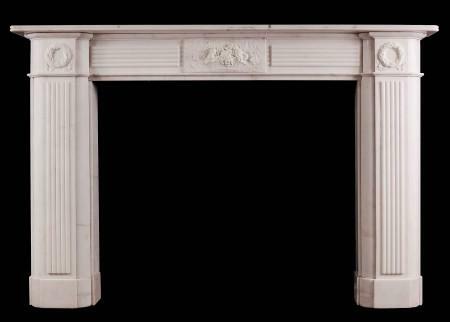 A fine quality period Regency carved Statuary marble fireplace in the manner of Thomas Hope. 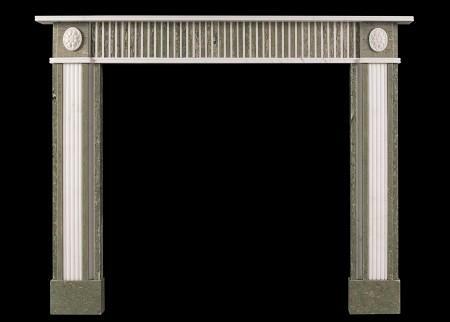 The jambs in the form of neo-classical torcheres decorated with acanthus. The frieze centred by an acanthus flanked by foliate scrolls. Reeded and ribboned moulding about the opening. 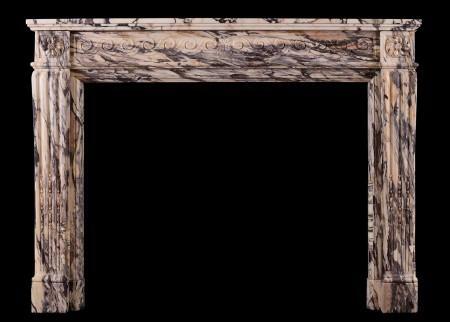 A fine quality piece with a strong neo-classical influence of the Italian designer Giovanni Battista Piranesi. Circa 1815. 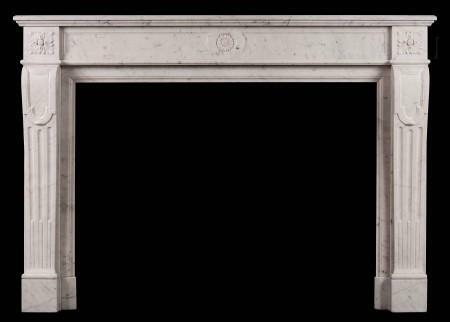 An 18th century Italian fireplace in white Statuario marble. 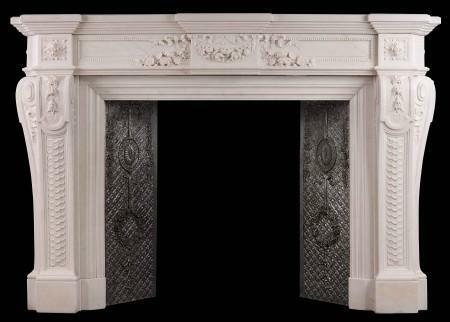 The panelled jambs with carved cascading foliage, surmounted by finely carved rams heads to end blocks. The centre panel with paterae, foliage and female figure to central plaque. Some later additions. 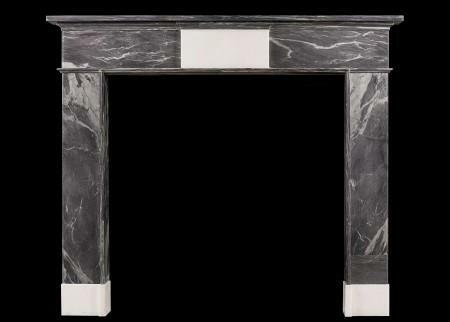 An elegantly shaped, petite moulded bolection fireplace in Italian Siena marble. English, 19th century. 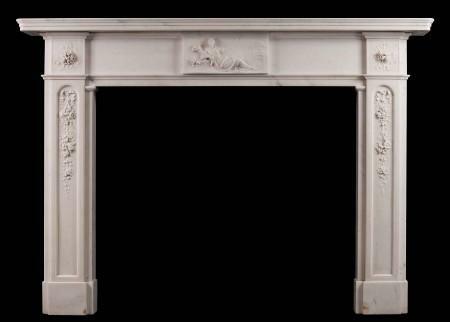 A carved English antique fireplace in Statuary marble. The jambs with tapering pilasters featuring finely carved bell drops and drapery surmounted by stiff acanthus leaf capitals. The frieze with concaved fluted paterae with carved mask to centre and classical urns to end blockings. Shaped, moulded shelf. 19th century, Regency style. 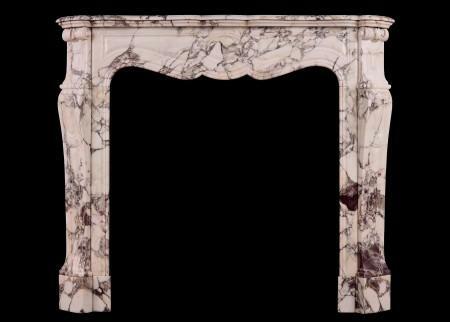 A French Louis XVI fireplace in St Anne des Pyrenees marble. 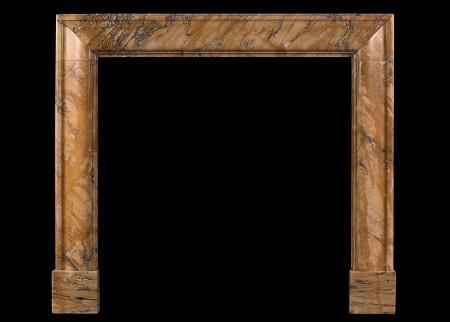 The stop-fluted jambs surmounted by carved Statuary marble rosette paterae. The panelled frieze with centre oval plaque. Late 18th century. 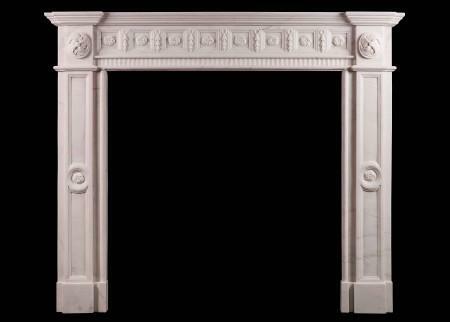 An impressive Regency fireplace in Carrara and Bardiglio marble. The carved Statuary marble centre tablet depicting the classical goddess Cybele, enthroned, with lion, cornucopia and mural crown. 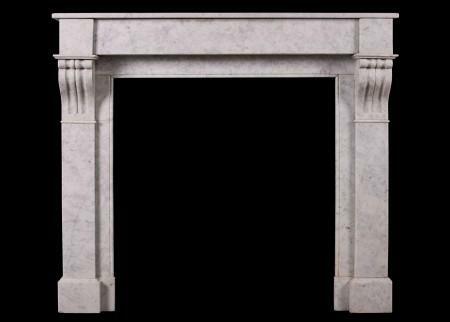 The fluted pilasters and carved oval paterae side blockings in grey Bardiglio marble, and matching grey reeded shelf and jamb outgrounds. The frieze and jamb panels of veined Carrara marble. English, circa 1810. 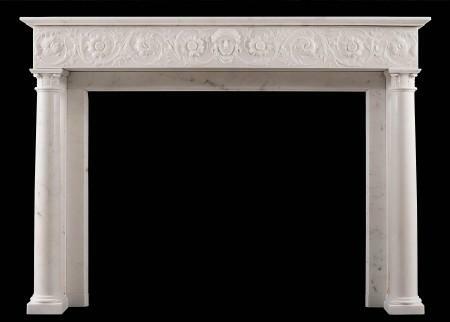 A striking Regency style fireplace in white marble with fine quality bronze detailing. The frieze with bronze female mask and ribbons with trailing foliage. 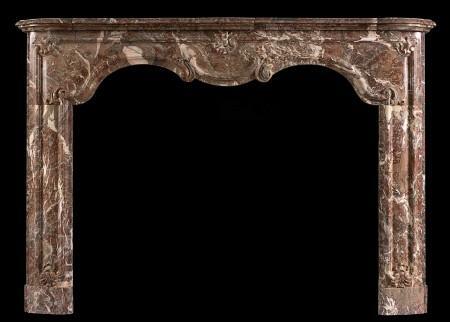 The fluted jambs with carved inner mouldings, adorned with bronze female figures and stiff acanthus leaves to base. Shaped breakfront moulded shelf. A copy of a period original. 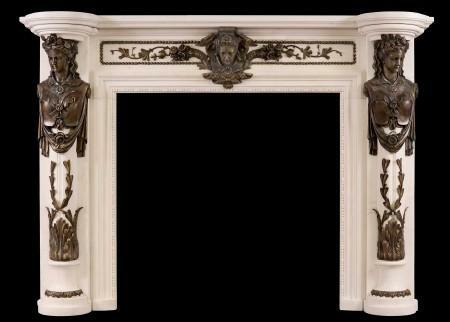 An impressive 19th century French fireplace with elaborate brass ormolu enrichments to frieze and jambs. The fluted half round columns inlaid with ormolu bellflower husks, surmounted by crest and figures. Guilloche foliage ormolu to frieze. Complete with original two cast iron side interiors. Good quality marble and ormolu castings. Circa 1800-1820. An elegant Irish white marble fireplace in the late Georgian style. The panelled swirled paterae to frieze interspersed with ringed bellflower drops with short fluted detailing beneath and moulded breakfronted shelf above. The side blockings and panelled jambs with associated paterae. 20th century. 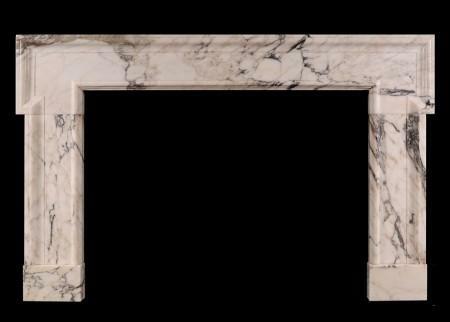 A fine Irish veined Statuary marble fireplace. The richly coloured inlaid centre tablet and side blockings in the manner of Pietro Bossi, with urns, bellflowers and foliage. Fluting to jambs and frieze, surmounted by moulded shelf. 19th century. A large, period Regency Statuary marble fireplace. The reeded jambs surmounted carved wreaths, tied by ribbons. 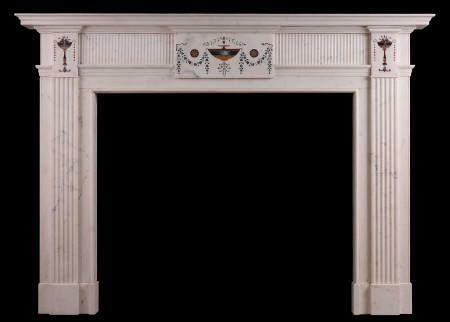 The reeded frieze with carved central plaque featuring basket of fruit and foliage. Reeded shelf above. An attractive, imposing piece. English, circa 1810. 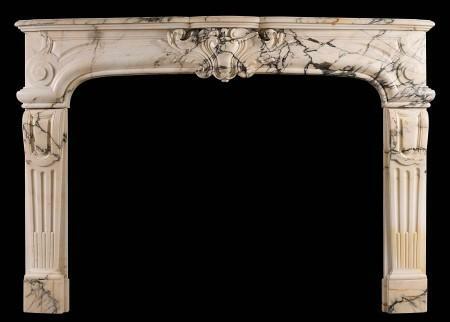 A 19th century French Carrara antique marble fireplace in the Louis XVI style. The panelled, stop fluted jambs surmounted by carved square paterae to end blockings. The panelled frieze with carved rosette patera to centre. Moulded shelf. A large, Georgian style architectural fireplace in veined Calacatta marble. English, modern. 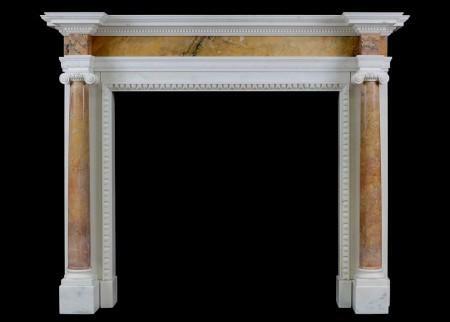 A George III style Statuary marble fireplace. 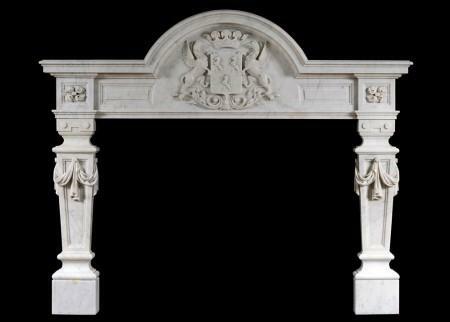 The design in the manner of Robert Adam with fine carving to frieze and jambs. The frieze with bellflower swags and paterae, the centre tablet with a cameo of Mercury, the messanger of the Roman gods with laurel leaves below. The side blocks with a quiver with ribbons above and falling drapery. The fully carved jambs with anthemion palmette, gadrooned urns, cameos, ribbons and bellflower drops. Moulded breakfront shelf. English. 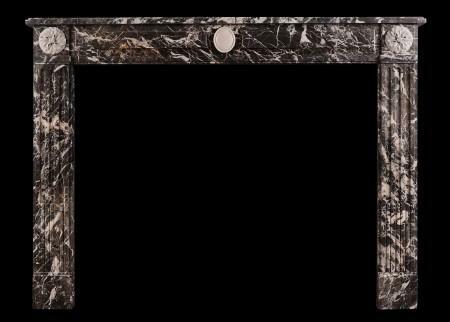 A fine quality French Louis XVI marble fireplace in striking Serravezza Breccia marble. The fluted frieze with carved square paterae to end blocks, the jambs with finely carved acanthus leaves and tapering panels below. Panelled outgrounds. Late 18th / early 19th century. Beautiful olive green tones to veining. A 19th century Regency marble fireplace in Carrara marble. The finely carved frieze with classical scene depicting swans drinking from urn fountain. 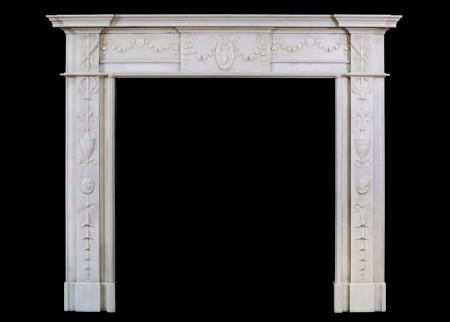 The shaped jambs with lion’s paw feet, surmounted by acanthus leaves, with fine carving to sides. Lion’s masks to end blockings with moulded shelf above. 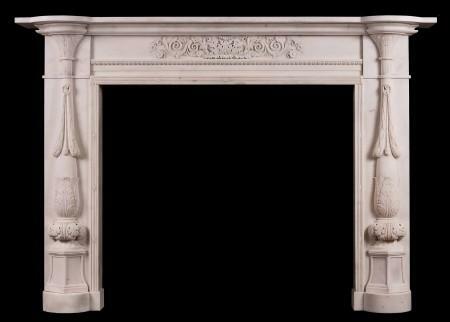 An unusual English Baroque style fireplace in Italian Carrara marble. The substantial frieze with a coat of arms featuring griffins and shield, with swirling floral paterae to end blocks. The tapering, panelled jambs with fine quality carved drapery. 19th century. 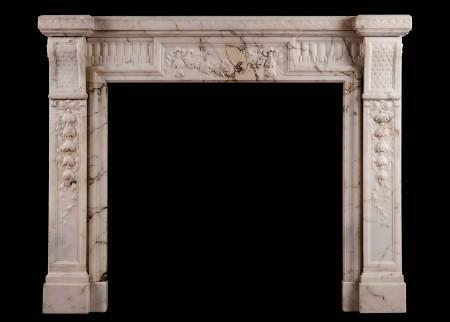 A good quality late Georgian Statuary and Siena marble fireplace. Finely carved urn to centre tablet with flowing drapery and foliage.The fluted jambs surmounted by similar carved urns and drapery, and shaped panels to frieze inlaid with Siena. Reeded shelf with bed moulding below. English, circa 1800.